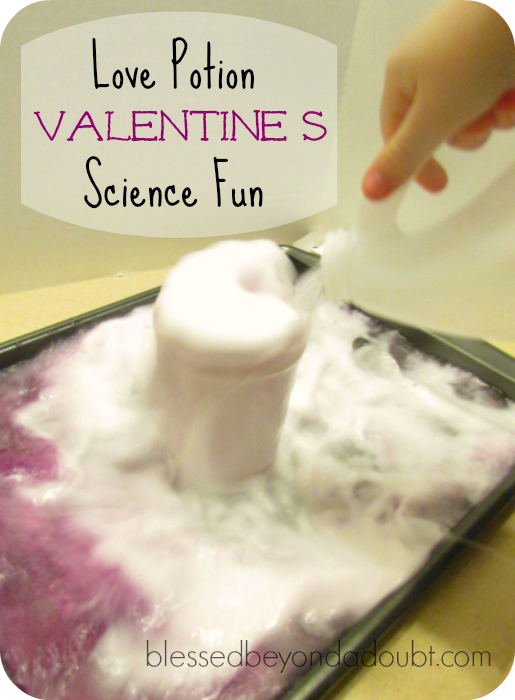 Baking Soda and Vinegar Reaction: Valentine Love Potion Science FUN! 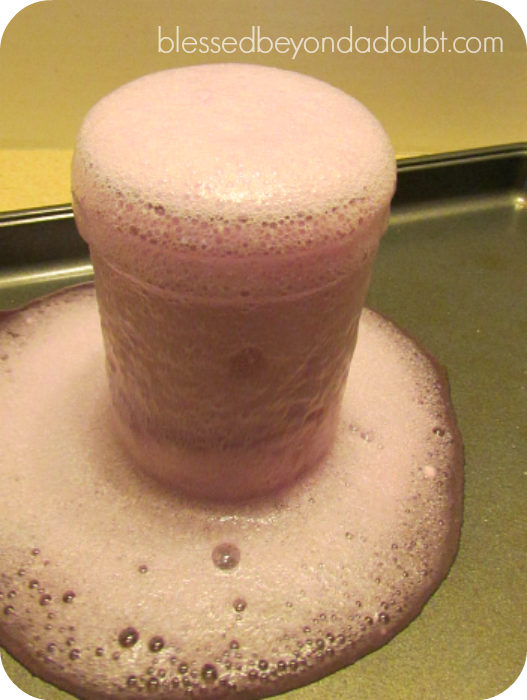 What kid doesn’t concur in the fun of a baking soda and vinegar reaction? I seriously have to hide my baking soda or I will end up with a big mess on a frequent basis in my kitchen. 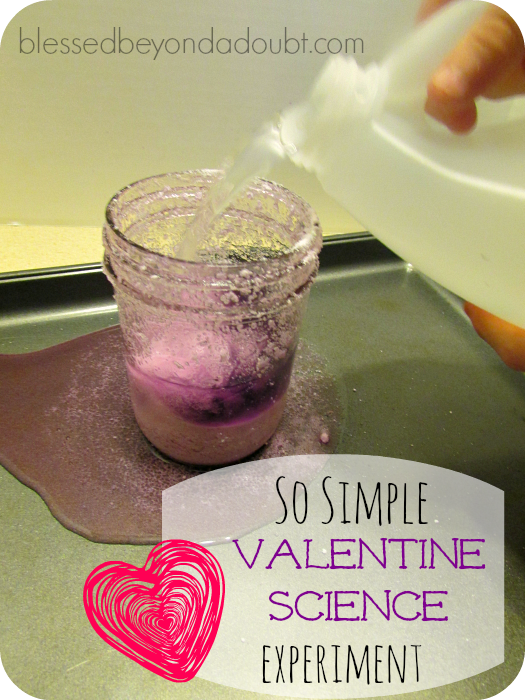 We gathered all of our supplies and decided to make some Valentine Love Potion. Now before you start sending me emails, let me explain. We talked about how silly it was that people actually believe that you will fall in love with Mr. Right with some sort of liquid. They thought that was pure bologna. We discussed how there is nothing you need to do to make God love us more. It doesn’t take love potion, straight A’s, or anything else. He just loves us. He created us in His image. And God doesn’t create junk. We love because He first loved us. 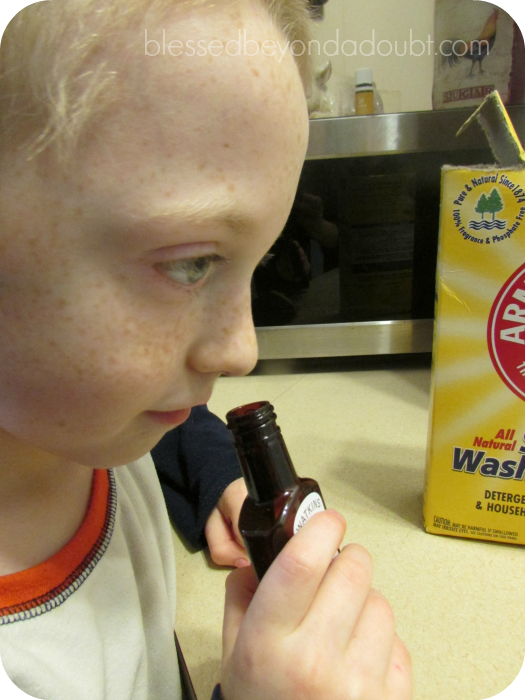 Before we started the baking soda and vinegar reaction experiment, I let my little ones smell the strawberry scent. They thought it smelled like kool aid. Next, I asked them all what substance they thought would make the chemical reaction? My youngest shouted, “God!” She got an A+ for the day. It was one of those bravo mommy moments, you know the ones that are far and few between. I got mine for the year. 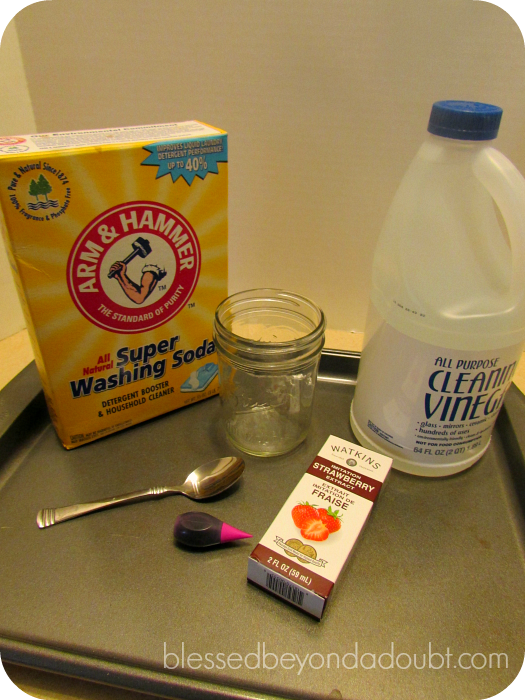 We put all of the ingredients into the glass jar and watched the baking soda and vinegar reaction. It was a demonstration on how God’s love is overflowing for us. Basically, I just let my children make a HUGE mess in the kitchen while they tried to figure out what made the baking soda and vinegar reaction. At last, they figured it out and they started estimating if the chemical reaction would overflow from the glass or not. I just let them have FUN and experiment. As you can see, they had a blast and I managed to survive the mess. Just be sure to have towels around and do the experimenting on a cookie sheet. Need more Valentine Science FUN? Be sure to download our FREE Download Valentine Bingo too! Follow our Homeschool FREEbies and Deal boards so you don’t miss any homeschool tips and resources! how much of each item did you use?